Getting to know the locals. All photos by Lee Litumbe. Cameroonian-born, Atlanta-bred Lee Litumbe takes a dynamic approach to photographing her travels, which she catalogs on her site . 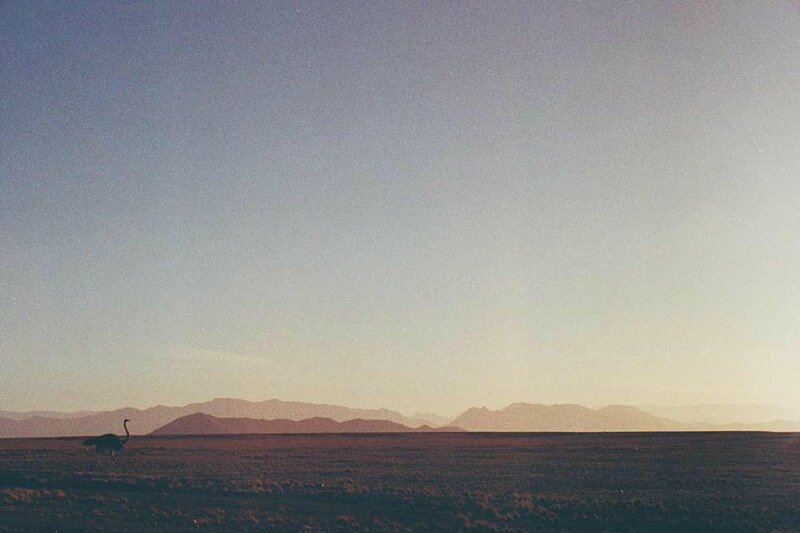 Equipped with a film camera and a sense of adventure, Litumbe recreated a trip her mother took to Namibia in the vast hinterlands of southwest Africa. 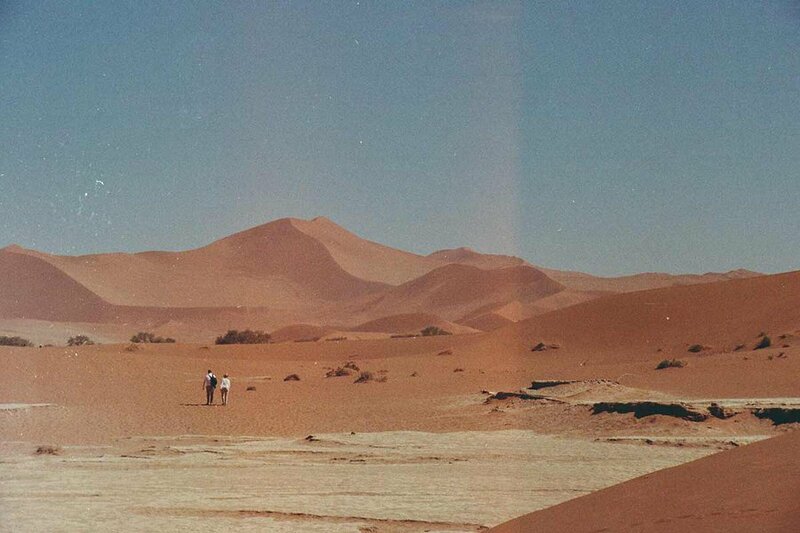 NAMIBIA – While on a business trip years ago, my mom had the opportunity to visit Namibia. 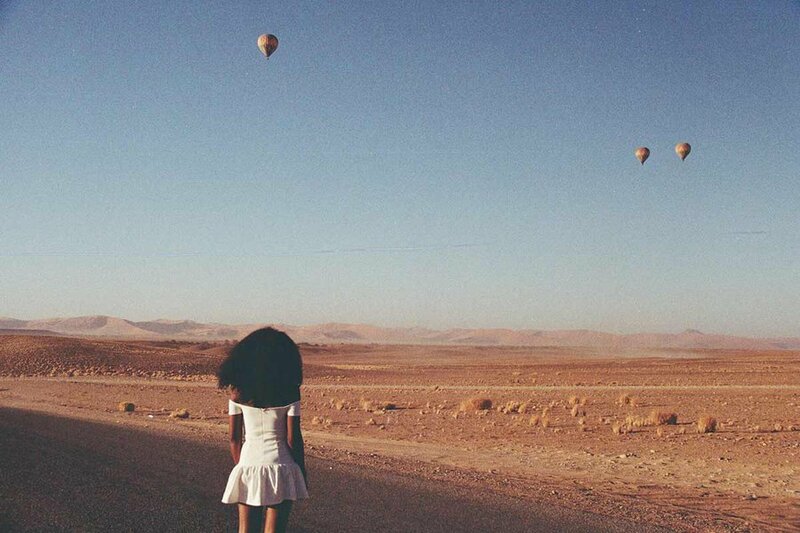 The surreal landscapes left her awestruck. 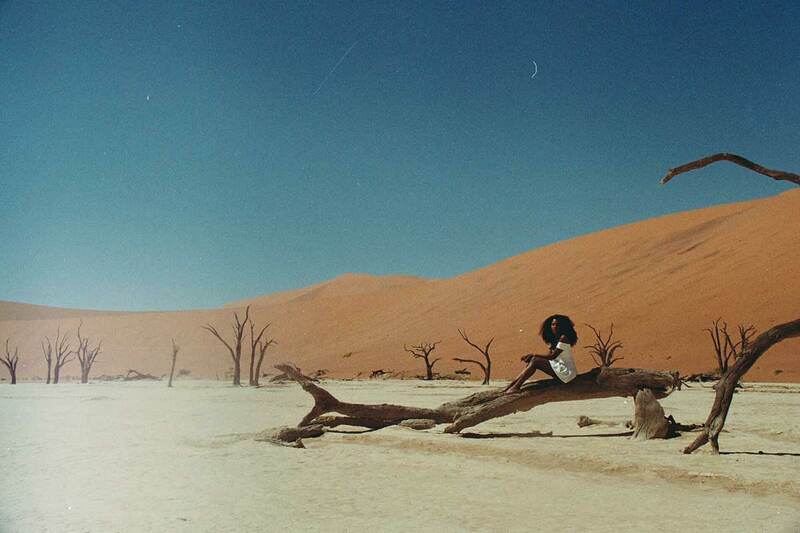 I listened intently, mesmerized as she shared her experiences of driving the Skeleton Coast, detailing what it felt like to witness the meeting point where the staggering sand dunes of the Namib Desert juxtapose against the piercing blue waters of the Atlantic Ocean. It was a description that struck a major chord within me. After securing a deal on a flight late last year, I spent hours combing through every blog, forum, and article online hoping to absorb as much information on the country as possible. 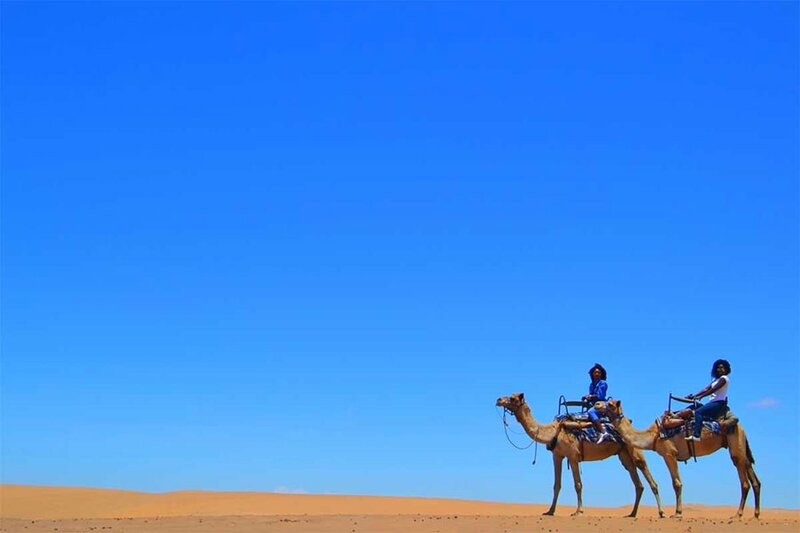 Namibia is extremely diverse, with a rich cultural history and contrasting landscapes of deeply colored deserts and sand dunes, vast plains, massive salt pans, boulder-like hills and pristine beaches. Not to mention friendly people, astounding night skies, and expansive wildlife. 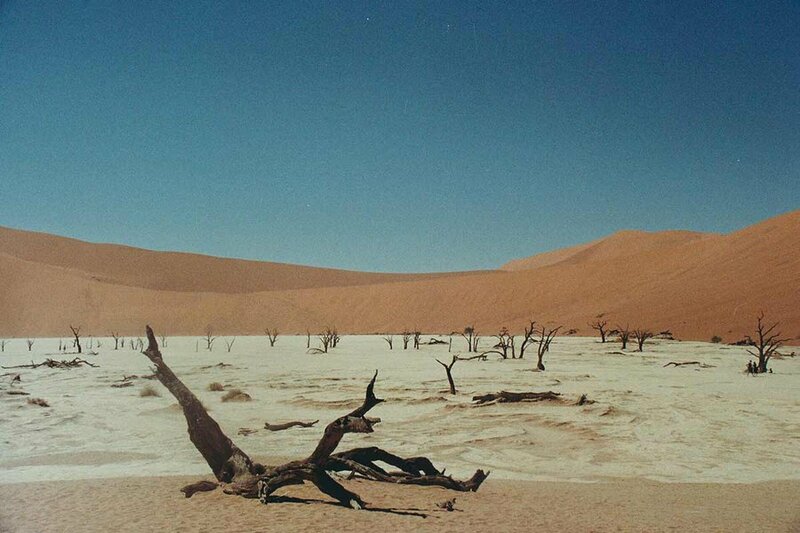 Getting to Namibia would be an adventure in itself. Atlanta to NYC: 2 hours. NYC to Johannesburg: 16 hours and 30 minutes. Johannesburg to Windhoek: 2 hours. My total flight time (without layovers): a whopping 20.5 hours. One way. 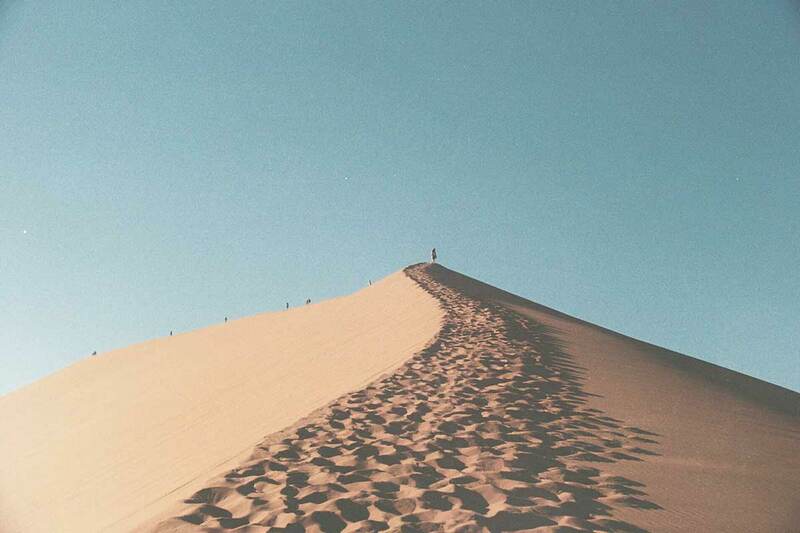 Once I factored in my very limited paid time off (the woes of having a corporate day job...), I began to doubt if going through with the trip made any sense. How would I possibly see and experience all that I hoped to in such a short amount of time? I decided I would just have to jam-pack all that I could into the ten days I had. Though I had to quickly accept that , a wildlife utopia and home to several threatened and endangered species, was completely out of the question, I was happy to set my sights on exploring the capital city of Windhoek, the red dunes in the salt pan of , the coastal cities Swakopmund and Walvis Bay, and maybe, just maybe, Kolmanskop, the ghost town in the Namib Desert. In an effort to cover as much ground as possible, I opted for a self-drive instead of a guided tour. While I'm not against guided tours, I am against the idea of traveling with large groups of people, especially in cramped spaces for long periods of time. Venturing out independently would be challenging, but it would be worth it, if only for the flexibility of changing or rerouting my itinerary at any given time. 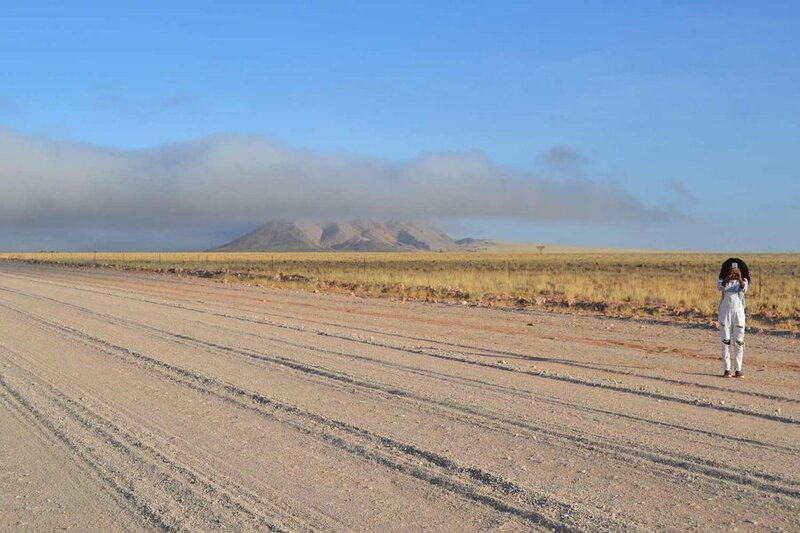 I learned it would be fairly easy to rent a car from the airport in Windhoek, though I would have to drive on the opposite side of gravel roads (steering wheels are on the right side in Namibia). What I didn't realize, however, was that most cars in Namibia are manual (which I have absolutely no experience with) and how unrealistic it was to think I would be able to safely drive long distances while still suffering from jetlag. A major oversight that seems quite silly in hindsight. 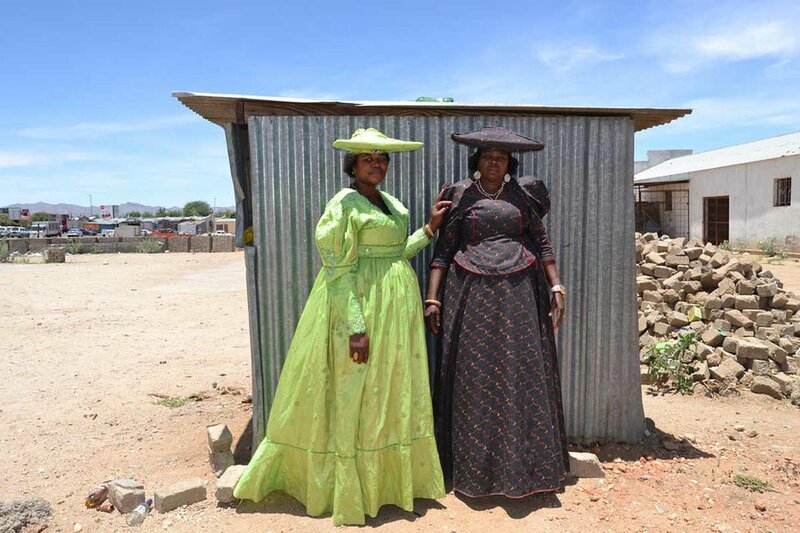 It wasn't until I actually arrived in Windhoek that I came to my senses and accepted that I would need to either hire a driver or succumb to a guided tour. A Hertz reps took pity on me and my sister and our unfortunate situation and suggested we hire an independent driver, , for the job. What a relief! Thomas would not only be our driver, but also our guide, friend, and the most integral resource for us throughout our stay. Finally sorted, we were able to start our Namibian journey. Our drive was filled with unique photographic opportunities, and the lonely winding desert roads we drove along were the charm that made the long distances between each destination masterful. What a delight it was to have a front row seat to watch all sorts of wildlife casually go about their daily rituals. To see the shifting sands, mountains, and gravel plains extend the entire length of the horizon, right from the comfort of our car, was incredible. There are a ton of hotels, but I chose to stay at campsites and lodges to fit my budget and provide opportunities to connect with locals in more organic ways. 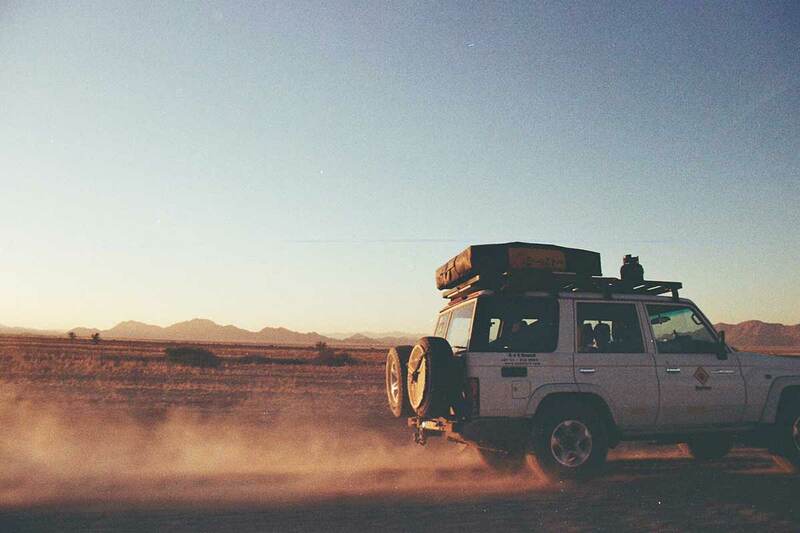 is quite a bit outside Namib-Naukluft National Park, home to major attractions like and , and is a nice way to experience a "soft adventure" camping experience and a moderately luxurious one. Perfectly isolated, the lodge granted me the opportunity to sleep directly under the crisp desert sky. There's no pollution and endless unobstructed stargazing views. I woke up at one point and caught a shooting star. Chirping weaver birds greeted us in the morning, as did springbok, baboons, oryx, and kudu. It all felt very dream-like. As you can tell, I'm a big fan of places that are slightly isolated. Which lead me to , a lodge located just outside Swakopmund city. What attracted me most to this particular place was the promise of remarkable views. Overlooking nothing but the exceptional sand dunes nearby, the lodge is an unique and peaceful environment paired with modern and comfortable decor. After spending the day exploring the beaches and desert, this was a great place to unwind in solitude. 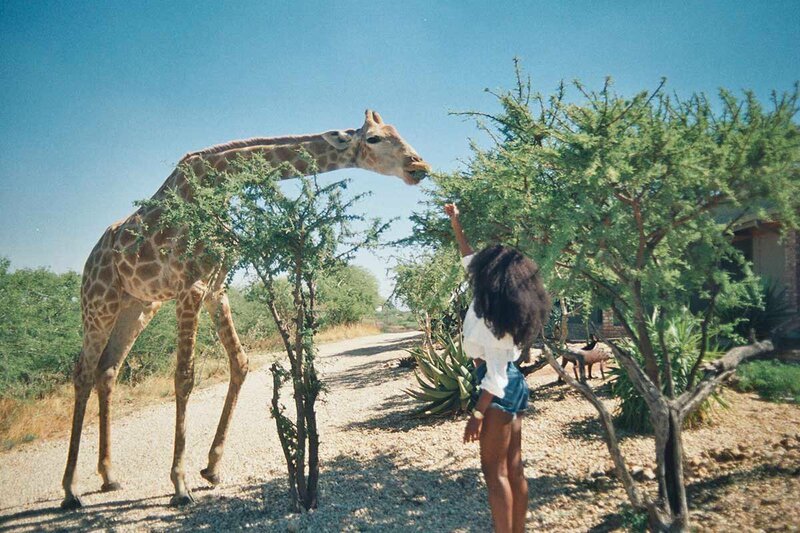 You can find of this story (including recommendations for Windhoek) on Spirited Pursuit. Lee is a U.S.-based visual journalist in spirited pursuit of travel, adventure, and new cultural experiences and founder of website. She travels to feed her soul while simultaneously photographing and sharing the beauty of often overlooked and inaccurately represented regions worldwide. You can follow her on Instagram. В интеренете нашел классный веб портал со статьями про профессиональная посуда.